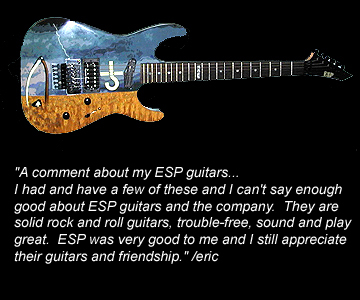 Special Update about this guitar: I recently gifted this guitar to my good friend Richie Castellano. 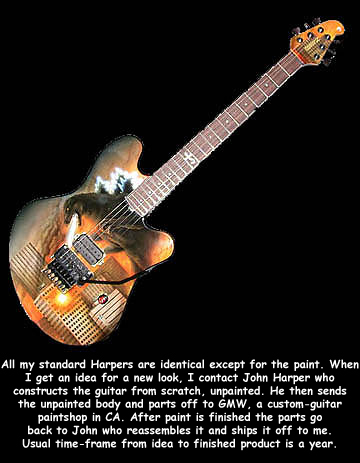 He had it cleaned up by a luthier and played it at a BOC show. It still plays and looks great. 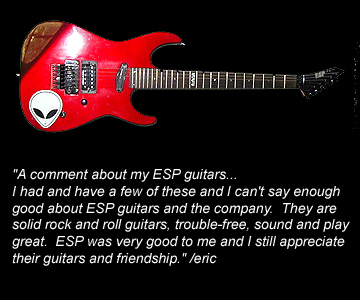 "This guitar is the original I played in 70's and has been sitting in it's case in my basement since then. It's the oldest BOC instrument I have. 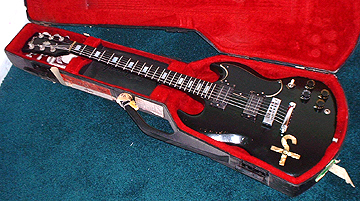 It had the Bigsby tremelo removed, holes filled in, repainted and the mother-of-pearl inlay done by the famous Renaldo before he made me the Logo-shape (guessing around mid-70s). I have another in storage done around the same time." 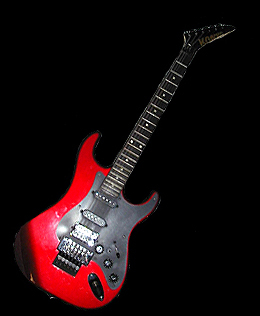 Harper Godzilla: Eric played this Harper guitar on tour for several years. It now resides on the wall of a "Hard Rock Cafe". 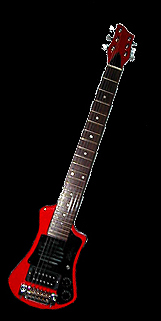 Harper Reaper: Eric played this Harper guitar on tour for several years. It now resides on the wall of a "Hard Rock Cafe". 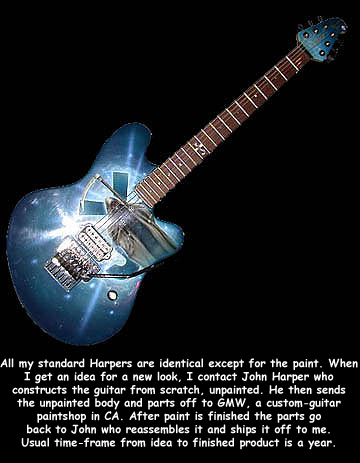 Harper Logo-shape: (Current Touring Guitar) "A few years back, inspired by Renaldo's original, John (Harper) made me a red BOC Logo-shaped guitar. While very nice to look at , it was an experiment, considering the shape. 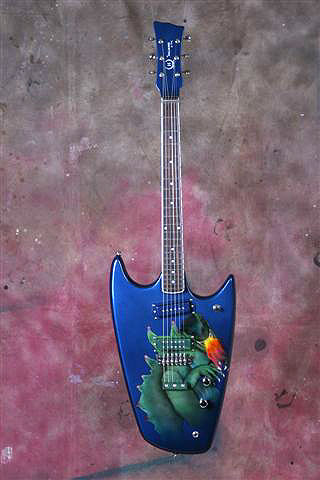 I found it hard to play because it was very light, no heft. On his own, John made this one and presented it to me during our 2003 tour of the west coast. 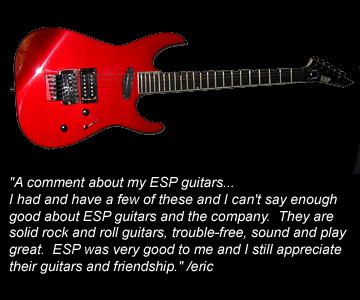 It plays much better than the red one and I used it nightly." 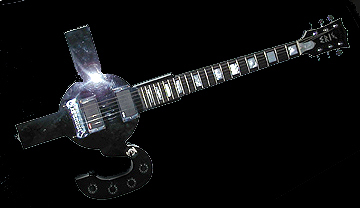 This guitar now resides in a Hard Rock Hotel. 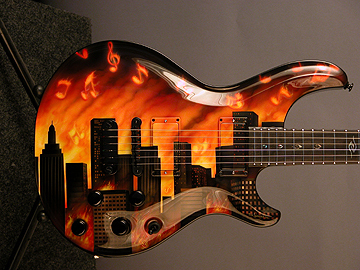 Cities On Flame: This Dean "Hardtail" is Eric's latest addition to the collection. Update: I use this guitar when BOC is using our own gear. I can't fly it since I can only carry 2 guitars on tour.